Forgive me if I'm harsh, and I know the point of the comic's business is to make money...but did Marvel really need to release this comic? 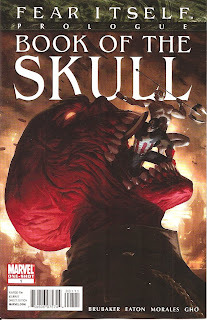 It isn't terrible, with good art and fine writing by Brubaker, but it just feels so unnecessary. 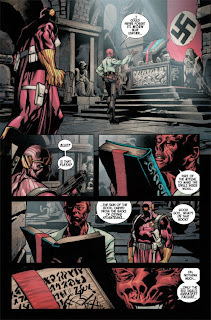 Basically, we start in the present with the Red Skull's newly-facially-scarred daughter, Sin, searching one of his old secret bases with the help of Baron Zemo (I thought he was a good guy now?) who says he is just doing it to repay a favor he owes. After that we cut to the past where we see the Red Skull summon a mysterious magical entity in a ceremony that involves cutting up Atlanteans and using their skin to make a book or something gross like that, followed by Captain America, Namor, and Bucky learning of this and following him to Antarctica. 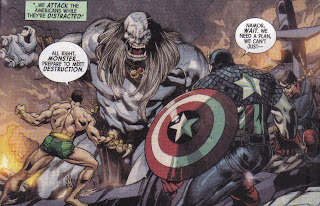 There is of course a big fight in the snowy wasteland with what appears to be a frost giant, and it is finally revealed that the Red Skull summoned....well, a giant hammer. 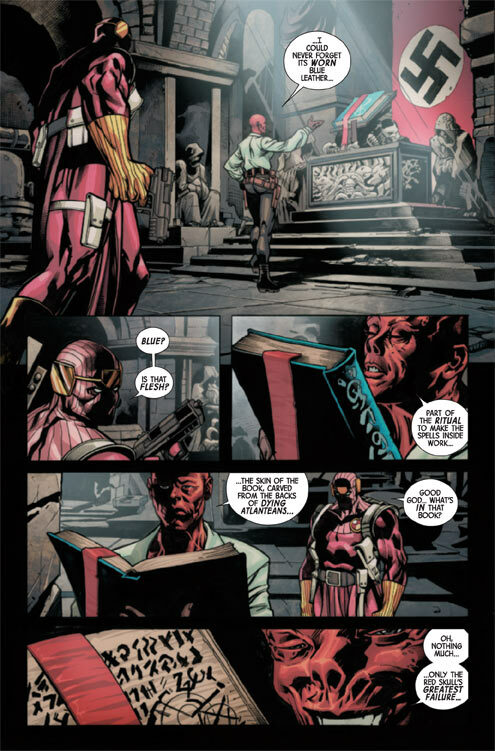 Then we cut to the present where Sin takes the creepy book, betrays Zemo, he swears revenge, and the issue ends. That's it. It would have been moderately easy to shrink this story down and stick it in as a back-up to Fear Itself or something like that. Instead we have this long comic that while looking good and having nice writing, seems kind of pointless and doesn't make it any more clear just what exactly, "Fear Itself" is about. Well, other than it seeming to involve people fighting for the right to wield a huge hammer--as those lame teaser images from a month or two ago illustrated. In terms of skill-craft it succeeds, but as a prologue that is supposed to get me all excited and pumped for "Fear Itself" it fails. Who knows, maybe this issue will turn out to be very important to the event--which if that is the case I hope they include this comic in the inevitable collection. As of now though, this comic is put simply, weak.